Every BBQ town is known for something different. Mark Lambert is a champion pitmaster from right outside Memphis, Tennessee, where BBQ is known to be tender and slow cooked, with plenty of vinegar. But Mark is here to tell you to keep your preconceived notions about BBQ styles to yourself. He cooks meat to blow your mind, not to make it taste like something you’ve had before. This is a guy who isn’t afraid to break tradition when it comes to crafting timeless flavor. 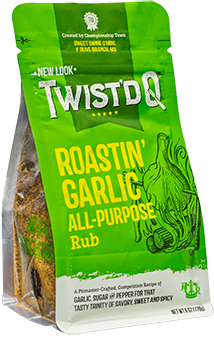 While many rubs only have two or three ingredients, Mark’s Roastin’ Garlic All-Purpose Rub has twenty-three. This may not be conventional, but the recipe helped him place in the top 10 (out of over 600 teams) at the American Royal World Series of Barbecue®, so it’s hard to say he didn’t do it right. Mark hasn’t always been in the Memphis area. He grew up in Oklahoma where he cooked, but didn’t necessarily BBQ. When he moved to Memphis, he was introduced to the art of pulled pork and smoked ribs. Out of college, Mark worked at a phone company that happened to have a BBQ team. When the company stopped sponsoring the team, Mark and the crew kept going. They had already caught the bug. This team, Sweet Swine O’Mine, has been competing since 1998. They’ve won countless competitions, including two grand championships at Memphis in May, where they had a bit of a home field advantage. And with perseverance and an unbeatable rub, they were crowned Memphis in May World BBQ Champions in 2009. When it comes to winning at these competitions, Mark believes it’s all about being prepared. You can’t win without having a routine. Weigh and sort meat, take inventory of the trailer, and make sure all the supplies are good to go well before competition time. That way, when they get to the cook site, the team can get down to business. Well, that is, after they have their 7:07 a.m. Bloody Marys. Superstitions are part of the routine, after all. This Labor Day, Mark and the rest of his team will travel to Kansas City to compete in the American Royal World Series of Barbecue where they’ll put their latest recipes to the test. We asked Mark what those judges should feel when they take the perfect bite. “Happiness,” he said.